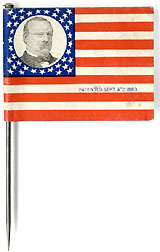 Flag banner promoting William McKinley for president and Theodore Roosevelt for vice president, 1900. Printed glazed cotton. Collins 827. Light soil. 45-star U.S. flag in national colors, right. On red field at left, blue and white medallions with portraits of the candidates separated by a white bow. 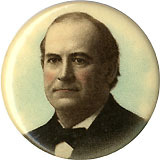 Top medallion has portrait of McKinley with legend, FOR PRESIDENT/ WM. McKINLEY. 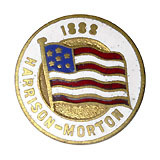 Bottom medallion has portrait of Roosevelt with legend, FOR VICE PRESIDENT/ THEO. ROOSEVELT. Sleeve for rod insertion along left edge. Design repeated both sides. 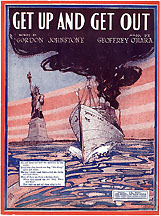 The use of the American flag as a campaign device was common in the 19th century, but with the dawn of the new century, the practise went into decline, and this is one of the last examples cataloged by Collins in his seminal work, Threads of History. A top-tier political textile for the advanced collector.